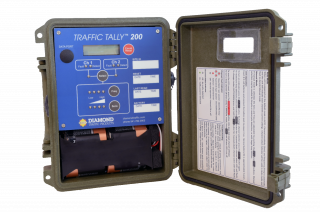 The Traffic Tally 200™ (TT-200) is our newest member to the Traffic Tally line of Inductive Loop counters. The TT-200 is a watertight solution that builds on and extends the TT-51 by adding an additional loop input while retaining over a full year of operation on a single set of 8 "D" cell alkaline batteries. The TT-200 accumulator features solid-state electronics compatible with existing inductive loops buried in gravel or cut into roadway pavement. The TT-200 has also been designed to offer the operator the ability to adjust the sensitivity and/or frequency of each loop independently, or to turn off a loop altogether. Operation is very easy using a 4 button interface. The unit contains a built in LCD to show accumulated counts on each channel and has LED indicators for channel status and activations. The operating instructions are easy to understand and are included on the underside of the lid for easy reference, no need to carry an operator's manual. The faceplate of the TT-200 offers the operator locations to record, in pencil or grease pencil, specific events such as the Site ID, Date & Time of (last reset, last read, & battery replacement). When these events are updated, the old information can be simply erased and updated. An optional accessory, available at time of order, is a Data Logger. The data logger records loop activations (by timestamp both on and off). Depending upon loop configuration and placement, the data logger could provide vehicle length, speed, direction in addition to volume style data. This data would be available in report format when the user processes the data with our Centurion software. The data logger has its own power supply operating independently with an estimated 5-year life span. The data logger can store up to 60 million events into its internal memory. Using Diamond Traffic's Centurion software, the data logger can be programmed for data storage. Data can then be retrieved by Centurion or our Optio android app for further processing by Centurion. Centurion software features advanced processing of data into 20 different report formats, while providing easy exports to Excel and 17 other export formats. The TT-200 can be operated in a standalone mode without the need for any external software or hardware. Optio Android App Download *Android device must support USB OTG* and be Android v4.0 or newer.